The School of Dental Medicine General Records were transferred to the University Archives from the Dental School Library in 2015 (Accession 2015:018, and 2015:025). The School of Dental Medicine General Records are organized into one series, which is arranged alphabetically. The School of Dental Medicine can trace its origin back to 1877 when the University of Pennsylvania Board of Trustees sought to establish a department of dental medicine based on a proposed by the medical faculty. A special committee of the medical faculty approached the two existing dental schools in Philadelphia – the Pennsylvania College of Dental Surgery and the Philadelphia Dental College – to explore a possible merger with the University. At that time both faculties declined the proposal, however Dean Charles J. Essig, and Drs. Drs. Edwin T. Darby, George T. Barker and James Tyson of the Pennsylvania College of Dental Surgery expressed their interest in the idea. As such, they were invited to join the faculty of the University and establish the new Department of Dentistry of the University of Pennsylvania, which opened in 1978. Over the course of the next century, the Department of Dentistry would grow in size and scope. The Thomas W. Evans Museum and Institute Society affiliation with the school allowed for the construction of a new building at 40th and Spruce Street (completed in 1915), which included both the Dental School with its new lecture halls, clinics, and laboratories, and the Evans Museum. 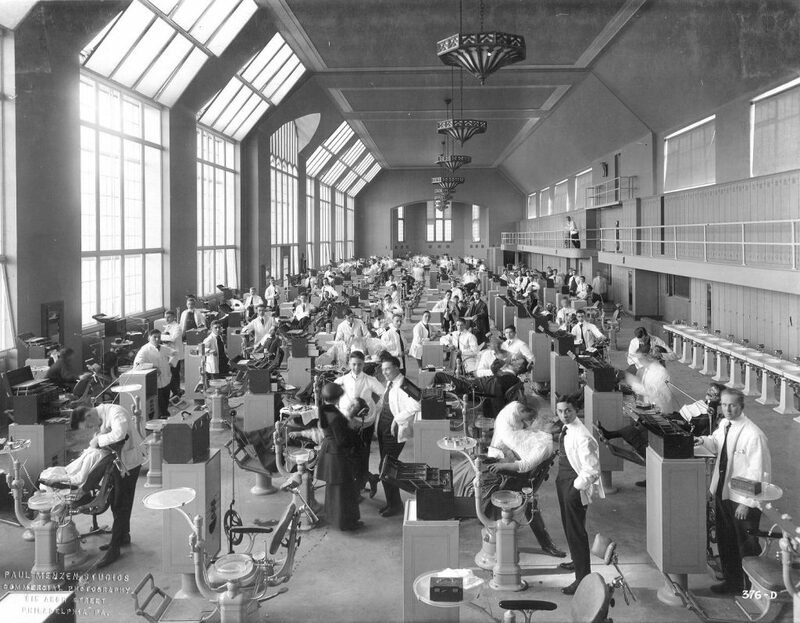 Expanded facilities were necessary as the student body increased with the admission of women in 1914 and the mergers with the Dental Department of the Medico-Chirurgical College of Philadelphia in 1916 and the Pennsylvania College of Dental Surgery (founded in 1856) in 1909. In 1921, Dean Charles R. Turner approved the establishment of the School of Dental Hygiene, whose chief administrative officer and faculty were to be staffed by members of the faculty of the Dental School. After completing a one-year training course, the student was awarded a certificate of proficiency. J.L.T. Appleton, dean from 1941 to 1951, emphasized the role of dentistry in the health professions and strengthened association with the Graduate School of Medicine and the Graduate School of Arts and Sciences. The school changed its name in 1964 from the School of Dentistry to the School of Dental Medicine. When the Dental School celebrated its centennial anniversary in 1978, it was the third largest in the United States with over 700 dental, hygiene and postgraduate students and a faculty of about 100 full-time and 300 part-time teachers. The School of Dental Medicine General Records is an eclectic group of items that document the students and faculty from the late nineteenth through mid-twentieth centuries. This includes application material, class information, financial records, department catalogues, and reports. Those seeking administrative information on teh School of Dental Medicine should consult the Deans Records. University of Pennsylvania. Thomas W. Evans Museum and Dental Institute. Appleton, Joseph Luke Biographical Material n.d.
Financial Reports and Statements n.d.
Thomas W. Evans Museum and Institute Society – Thomas Evans Will, Charter, and By-Laws n.d.